The R kernel is compromised of scripts written in the R and C programming languages. It includes a set of core function libraries, an interpreter for machine interface to run R scripts or functions, and a set of powerful graphical devices. 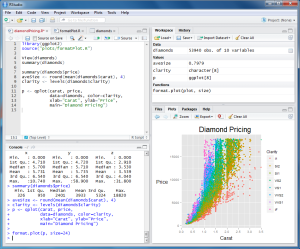 In total, these elements are referred to as base R.
RStudio is an IDE (integrated development environment) and user interface tool for base R. It delivers a range of utilities and functionality to maximize data and programming control, project work flow management, and document creation. RStudio is also extensible for C-coding and for integrating thousands of package objects. 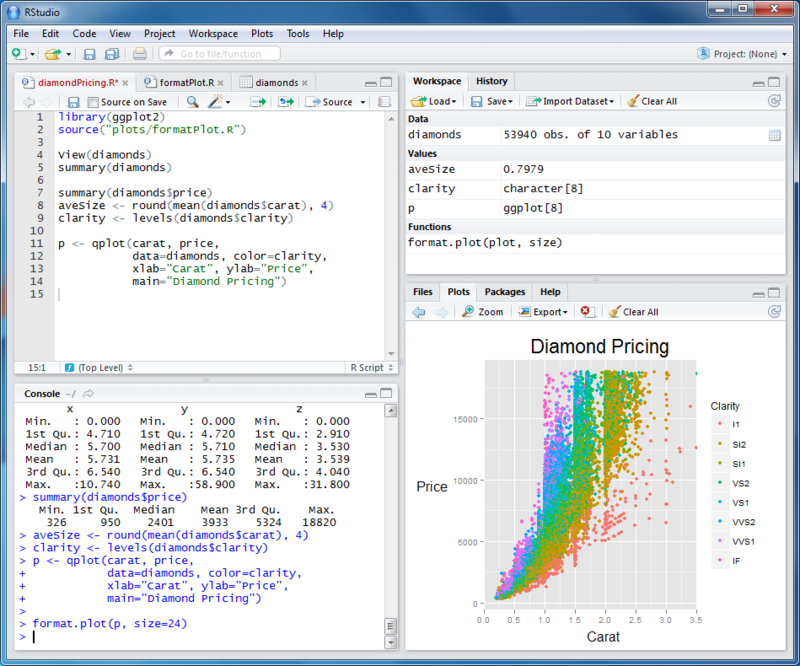 RStudio can be downloaded for free here. Utility Pane for graphics, R package management, R help (lower right). The Text Editor in RStudio is where basic scripting (or source code development) takes place. The Editor is also the place to execute R source code. Code can be run on a line-by-line basis, the last source execution can be repeated, or the entire file can be sourced. The entire code block is executed by hitting the Source button. Line-by-line execution is accomplished by placing the cursor at the top of the script file and using the Run button. Multiple lines of interest can be run by painting the target lines and again hitting the Run button. The last run command can be repeated by hitting the Re-run button. Code results can be found in the console or plot panes. The above code generates a plot image in the plot pane. Hitting the Zoom button will launch a new window, where the details of the pairwise scatter plots can be viewed more clearly. The Plot pane also has interactive features for exporting the graph. Source code is saved by returning the editor pane and using standard save features on the RStudio menu. The RStudio console is for interactive data management. The console is the interactive command line interface for base R and the computer’s operating system. The results appear in the HTML Help pane. R case is sensitive: object X is not the same as object x. All commands entered into the Console appear in the History Log. See Help documentation on the history() and again() functions for details. The entire command history can be displayed by setting the max.shows argument to INF. The short sequence Ctrl+Up (Linux and Windows) or Cmd+Up (Mac) will trigger a pop-up history command. History logs can be quickly copied for re-sue or to facilitate scripting of complex commands. R will look through each directory in the search path in the order profiled to find a data object. New data objects are always written to the directory occupying position 1, the current working directory. The current working directory is displayed in the top frame of the Console or can be obtained by typing getwd(). apropos("GLM")  ".__C__anova.glm" ".__C__anova.glm.null" ".__C__glm" ".__C__glm.null"  "anova.glm" "anova.glmlist" "glm" "glm.control"  "glm.fit" "glm.fit.null" "model.frame.glm" "predict.glm"  "print.glm" "residuals.glm" "rstandard.glm" "rstudent.glm"  "summary.glm"
Every R object can be stored into and restored from a file with the functions save() and load(). The functions use the XDR (external data representation) standard of Sun Microsystems and others, and is platform-independent so data is portable between MS-Windows, Unix, Mac.